Last week I promised some healthy, dairy alternatives to indulgent foods. So here are some of my family’s favourites. Because they taste so good there is no need to cook ‘theirs and mine’ – even with guests over they usually never know the difference. I once served hung sheep yogurt with apple pie and my dinner guests commented on how nice the ‘cream’ was. When you hang yoghurt you remove some of the water. It becomes thick and creamy while retaining the live bacteria that aids digestion. Line a sieve with a clean tea towel or piece of cheese cloth. Spoon 2 cups of cow or sheep milk yoghurt into the lines sieve. Balance the sieve over a bowl, cover with cling film and leave for 24 hours in the fridge to drain. Tip the hung yoghurt onto a plate and peel of the cloth. Or scrape it out. Enjoy as a creamy condiment with anything from fruit salad to hot apple pie. Or use as a creamy savoury cheese (also known as labna). Deceptively simple to make yourself, mild tasting, super creamy and healthy. Soak 1 cup of raw, unsalted, cashews or macadamias in enough water to cover. Soak for 4-8 hours. Don’t leave them for longer than overnight. Drain the soaking water and place the cashews in a blender. Puree with just enough fresh water to help them puree. Scrape down the sides of the bowl frequently and puree until smooth. 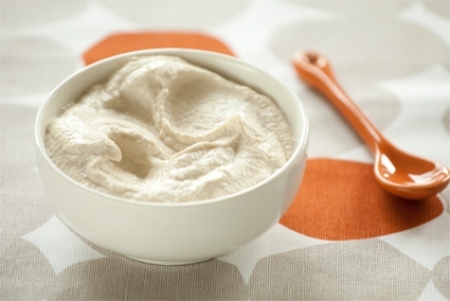 You can add sugar/honey, vanilla, cinnamon or brandy to your cashew cream for a flavour or festive twist. It is also great with lemon juice added as a ‘sour cream’ – for use in sweet or savoury cooking. I love making a cashew ‘cream cheese’ icing by adding icing sugar, vanilla, lemon zest and juice. Make delicious dairy free butter chicken, lamb korma or other creamy curries and stews by adding at the end in place of cream, yoghurt or sour cream. Delicious! Made the same way as the cashew cream. Soak the nuts, drain and puree with water. You will end up with a thinner, pouring cream consistency. The almond/hazelnut flavour works well as a coffee creamer or poured over pies and puddings. Thin to a milk consistency for your own fresh almond/hazelnut milk. If you want a super silky milk/cream then strain it through a clean tea towel or cheese cloth – squeeze well. Keeps for up to a week in the fridge. A lovely thick base for creamy sauces. High in protein and other minerals. Quinoa is a healthy gluten free seed that is considered an ‘ancient grain’. Cook 1 cup of quinoa in 3 cups of water with the lid on until tender. At the end add 1 cup of blanched almonds and allow to soak together for at least and hour of the heat. Puree this almond and quinoa mix with extra boiling water if needed, scraping down the sides of your blender every so often. The almonds make the quinoa flavour milder. Use this as a savoury creamy base for sauces like you would a béchamel sauce. You don’t have to miss out on your favourite ‘indulgent’ dishes when you eat healthier. I adamantly believe in making my favourites both healthy and just as indulgent as the original recipe – so when you enjoy it you don’t feel any guilt and you enjoy it as much as you aught to! Can be made Gluten Free, Dairy Free, even Garlic Free for a low FOODMAP diet. Slice the potatoes as thinly as you can – this means lots of layers and more flavour in between. Lay one third of the slices in a medium oven dish and sprinkle with a third of the garlic and herbs, salt and pepper to taste as well as quarter of the cheese. Repeat twice more but reserve the last half of the cheese. Mix the flour with a little of the milk until smooth, adding the rest of the milk until it is all incorporated. Pour the flour mix over the potatoes then sprinkle with the last of the cheese. Bake at 180’C for 20-40 minutes, until the potatoes are tender when skewered through, the milk has thickened and reduced to a cream consistency and the cheese is golden and bubbling. This dish is great re-heated so I always make double and either freeze or refrigerate the left overs for another day. You can add sliced onion, mushroom, spinach or other vegetables to the layers as well. *Use organic if you can. Most varieties work well but I like Dutch Cream potatoes for their lovely buttery colour and flavour or Desire potatoes for their pretty pink skin and fluffy texture. ****Most almond milks have a little sugar or agave nectar added, so just make sure you get one that is not too sweet. Next week I will share a lovely dairy free béchamel sauce that you can use as a base for many other recipes. I’ll tell you how to turn it into vegetable bake, carbonara and stroganoff. We’ll also go over some dairy free troubleshooting – how to solve common problems when you are trying to take dairy out of your diet. As always, if you have any requests or comments just leave them below.